Good four gaited competition horse with good tölt. Son of the four gaited stallion Leiknir frá Vakurstöðum (8.28) and Framtíð frá Keflavík (7.99). Steinn frá Hvítadal is a good four gaited competition horse with good tölt. Son of the four gaited stallion Leiknir frá Vakurstöðum (8.28) and Framtíð frá Keflavík (7.99). Steinn has received 8.30 in B-Class (four gait) Preliminaries. 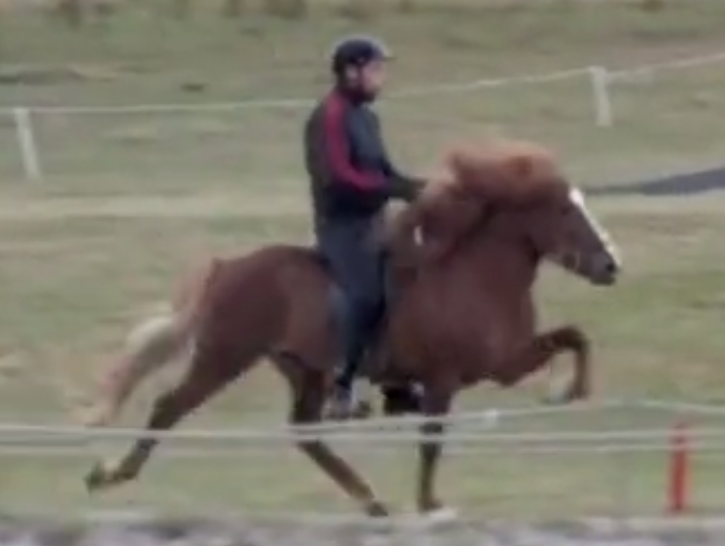 His father, Leiknir frá Vakurstöðum (8.28) has 8.44 for Riding Abilities; 9 for tölt, 9 for trot, 8.5 for gallop, 9.5 for spirit, 9 for general impression and 8 for walk. He has also 8.5 for slow tölt and 8.5 for canter. His mother, Framtíð frá Keflavík (7.99) has 8.21 for Riding Abilities; 8.5 for tölt, 7 for trot, 8 for pace, 8.5 for gallop, 8.5 for temperment, 8 for character and 8.5 for general impression. Click here to see video of Steinn frá Hvítadal.